The wombat's chances of survival in the larger world will depend on several factors; the choice of an eventual release area should be balanced against these factors. To illustrate, here are three case histories of wombats reared in differing situations. Wombat B's foster home is a small mixed farm in a valley of small mixed farms from which wombats were eradicated many years ago. She is allowed to roam freely in and out of the house during the day and lives on the farm's pasture grasses. She is locked up for the night in an old stable, but has dug her way out on several occasions and wandered as far as a neighbouring farm, where she has begun to dig a burrow under the house. The neighbour is complaining that his house is sagging and has threatened to shoot the wombat if she visits his farm again. Wombat C lives with a National Parks ranger and his wife. The doors of their home open on to natural bushland, and the orphan is one of a number of wombats that have been reared there. Some of these other wombats still visit the house, which has a 'wombat door' - an enlarged version of a 'cat door'. The young wombat has spent many hours exploring the surrounding bush at his foster mother's heels, eating a wide variety of forest grasses and practising his digging skills on an old burrow begun by an earlier orphan. Although he still sleeps in the house for part of the day, he is becoming very restless at night and will soon want to make unaccompanied expeditions into the bush. What are the alternatives facing the fosterers of these three young wombats, and what are the chances of survival? The first option that occurs to many people is to send the young wombat to a zoo where they believe it will be safe and well cared for. This is true, but it will also be living a very restricted and unnatural life. A wombat is essentially an independent creature, and a life of close confinement must be almost intolerable until the animal's senses are dulled by the endless boredom. Privately owned wildlife parks are a newly flourishing industry, and some of these parks have permits to accept young hand-reared wombats. Here they will have a limited amount of freedom as well as continuing contact with humans. This might be the best solution for an orphan such as wombat A, which has had no opportunity to adjust to its natural environment, with all its risks and uncertainties. The ultimate aim is, of course, to return the wombat to the wild, but achieving this is not as simple as it sounds. People who drive out into the country, take the wombat out of the car and, while it is investigating its novel surroundings, drive away without it, are not only very stupid but also cruel in the extreme. The wombat is unlikely to live long enough to 'return to the wild'. If its distress and confusion, as well as its physical miseries of hunger and exposure, do not lead to its death, then a dog or a motor vehicle almost inevitably will. Releasing a hand-reared wombat in the bush can have a reasonable chance of a successful outcome only if considerable time and effort are spent over the venture. If the site for release is carefully chosen, and if a familiar human can stay at the site with the wombat while it gradually settles into its new environment, there is a fair chance that it will survive. A camping or caravanning holiday spent in an area of wombat habitat will enable an 18-month-old orphan to taste the delights of being a wild wombat while remaining in contact with its human family and will make the eventual separation less distressing for both. With this kind of introduction to the wild, wombat A might eventually become habituated to 'living free', provided that he did not meet a dog out hunting for a meal before his familiarity with the family pet was forgotten. 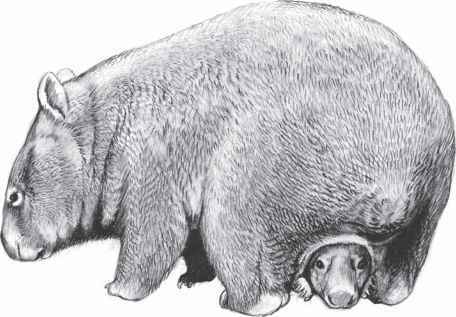 Wombat B would almost certainly adapt successfully. Wombat C, of course, has excellent prospects of being assimilated into the local bush scene while still retaining the security of his foster home. His foster parents might still suffer from disturbed nights, but they would have the compensation of continuing to enjoy contact with the orphan (Figure 8.4). I began this chapter by quoting a 'wombat owner'. I will end it by contradicting myself: no-one ever 'owns' a wombat. Nor do wombats make good pets. Although an orphan wombat is utterly dependent on a human for its food and comfort, it never becomes truly domesticated; it remains a wild animal, content for a time to share a home with people.